City College of San Francisco serves a student body with more than 60,000 people and offers courses in over 100 disciplines. Whether they’re new to their fields or experienced professionals, CCSF students are skilled, educated and ready to join the Bay Area workforce. CCSF is an accredited institution of higher education serving the diverse Bay Area communities. More than 75% of students work while pursuing a degree, and see their City College education as a path to career advancement. Whatever their background, students are ready to learn and earn. As a vital part of the local economy, CCSF prepares students to connect with employers through internships and job opportunities. Employers demand diverse talent to grow their businesses. For large companies, small businesses, and everything in between, City College is ready to step in and connect! Students and graduates make up a talent pool already living in the San Francisco Bay Area, offering employers a continuous supply of prospective employees. 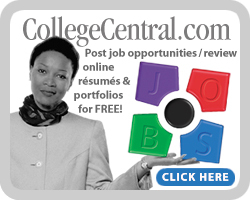 Create an account with our College Central Network. Post jobs and internships and register for career events and on-campus recruitments. Join an industry advisory committee. Share your expertise and sign up as a guest speaker, career panelist, or mentor. Workforce Wednesdays Career Panels: Share your insights and experiences with students and answer their questions about what your fields are like, what you love about their jobs, and advice you have for current CCSF students. Fill out our Employer Engagement form here. Recruiting and retaining skilled employees can be challenging. Apprenticeship reduces the need for expensive recruitment programs by creating a flow of candidates who are screened for minimum requirements and trained by CCSF to meet the specific, technical skills needed on the job. The cost of wages for apprentices is less than that for regular employees. Additionally, apprentices who complete a program often feel a commitment to their work and loyalty to their employer. If you’re interested in apprentices being prepared in our programs or wish to collaborate in the development of a new program to meet your job demands, please contact us. CCSF Extension provides customized performance-based training, assessment and consulting services to help local employers reach their performance goals. CCSF Extension works closely with employers to identify causes, conditions & barriers of your performance gap, and will tailor specific solutions to close that gap and recover, enhance & improve your competitive advantage. The Governor’s Office invited City College of San Francisco to produce the Climate Action Career Fair on September 14, 2018 as an affiliate event of the Global Climate Action Summit. CCSF partnered with LinkedIn, which hosted the event at its San Francisco office, to educate, motivate, and inspire college and high school students, on the multitude of educational and career pathways in energy, environment, and sustainability. On April 13, 2018, CCSF Career Services honored and awarded businesses that have partnered with CCSF in training and employing CCSF students. These partnerships have been critical to student achievement and success. See events on our College Central Network Calendar.